Having made a tentative beginning on Saturday, I spent Sunday afternoon making more hearts and am delighted to say that I got a little bit better with every heart I made. I brought them into the shop this morning to show mum, and - just for fun - popped them into a display bowl to see how they looked, and I really am quite pleased :-) I mean, I know they're not good enough to sell (they're stuffed with lumpy bits of cotton wool for one thing!) but I think there is potential. I'm really quite chuffed. Well done Charlotte! Glad that you have now joined the club of exclusive 'haberdashery' enthusiasts! Hi sweetie, thanks for your lovely messages. I am OK thanks, the cold seems to have stalled at the sneezing stage! Which is v good news. How are you feeling? 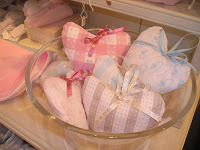 Your hearts are great, I've made one without a hole before too :-S The fabrics you've chosen are lovely, I especially like the blue loopy looking one. I work in an estate agents so we get all sorts in asking for details or wanting to register. Most people are lovely but occasionally you get one of those men who can't stand talking to a WOMAN (oh no! who knew we could have jobs now?!) or people who just love themselves. Same as anywhere I guess. Just posting to see if you're OK? Well done with the hearts they look gorgeous! Sorry it has taken me so long to get back to you about the cami and cardi, I’ve not been blogging much, they are from Joules; they have got some lovely bits.